This section of the Administration console allows you to set up all the integrations to get the most out of DeskDirector. 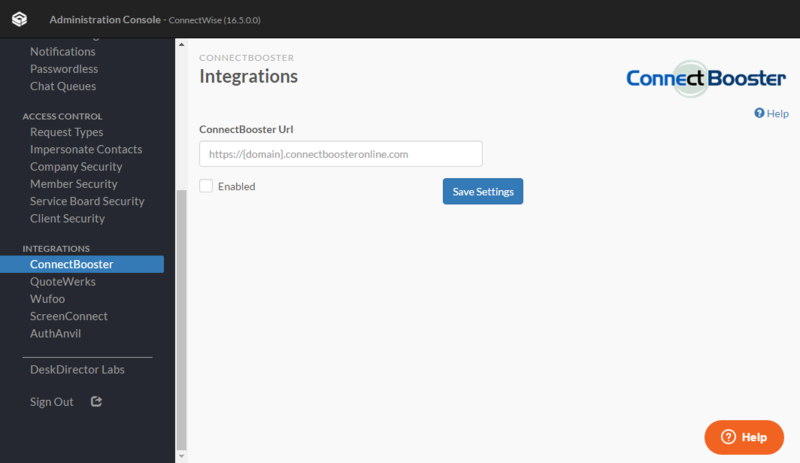 To enable ConnectBooster integration in DeskDirector, you just need to fill in your ConnectBooster URL in the URL box. Tick the Enabled box, then save settings. To enable QuoteWerks integration, click the Enable button, this will open up the integration screen. On the integration screen, add the statuses that you want clients to be able to see. Add the QuoteWerks quote statuses that you want clients to see as Open to the Open Status List. Add QuoteWerks statuses that you want your clients to see as Closed as the Closed Status List. Download and save the QuoteWerks Script to the QuoteWerks Folder. Add scripting lines to SITE.INI file by opening the SITE.INI from the root of the QuoteWerks application folder. Then add the following lines at the end of the file and save it. Restart QuoteWerks and the implementation is complete. After you restart QuoteWerks, whenever you Save or Print a quote it will update DeskDirector with the quote, including the QuoteValet URL. Clients will see these quotes under the Recommendations section. Wufoo integration in DeskDirector is simple. All you need is a paid Wufoo account. The free accounts will not allow you to create tickets or opportunities in ConnectWise. 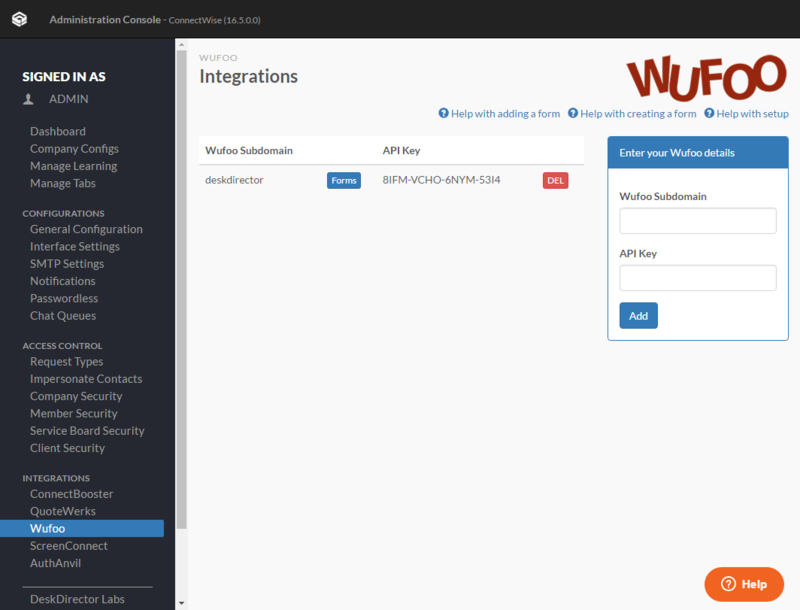 To integrate Wufoo with DeskDirector, you will need your Wufoo subdomain, and your Wufoo API. When you create your Wufoo account you will get a subdomain. This is the first part of the URL you use to connect to Wufoo. For example, if your URL for Wufoo is: https://deskdirector.wufoo.com Then your subdomain is deskdirector. To get your wufoo API, you need to log in to your wufoo account, then head to the Form Manager or Forms tab. From the forms manager click the Share button underneath the name of a form (you must have a form created). This will take you to the Form Code Manager, form which you can click the API Information button to access API credentials. On that page there should be a 16 digit code, which is your unique API key. Copy or write this down. 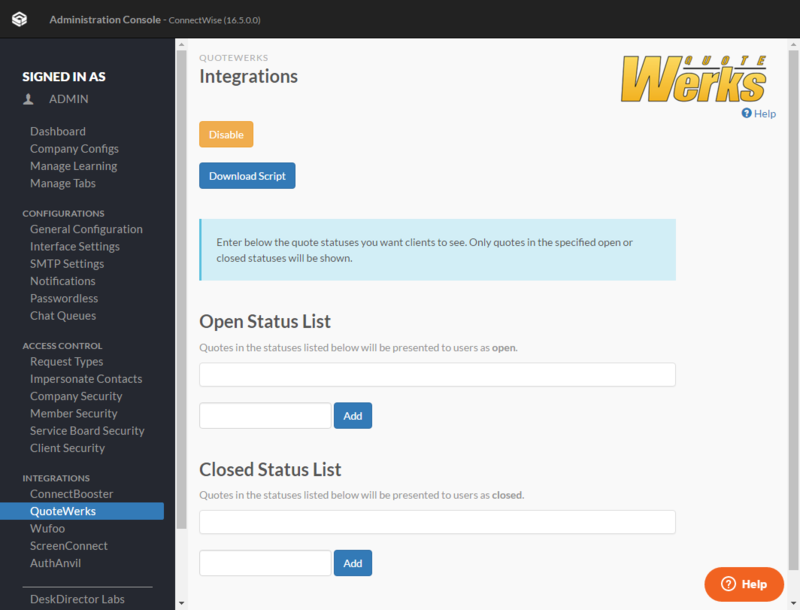 Back in your DeskDirector Admin console, you must enter your Wufoo details on the integration page. Once you do and you click add, the subdomain and API will appear on the integration page as saved credentials. This is all you need to do to finish the integration. 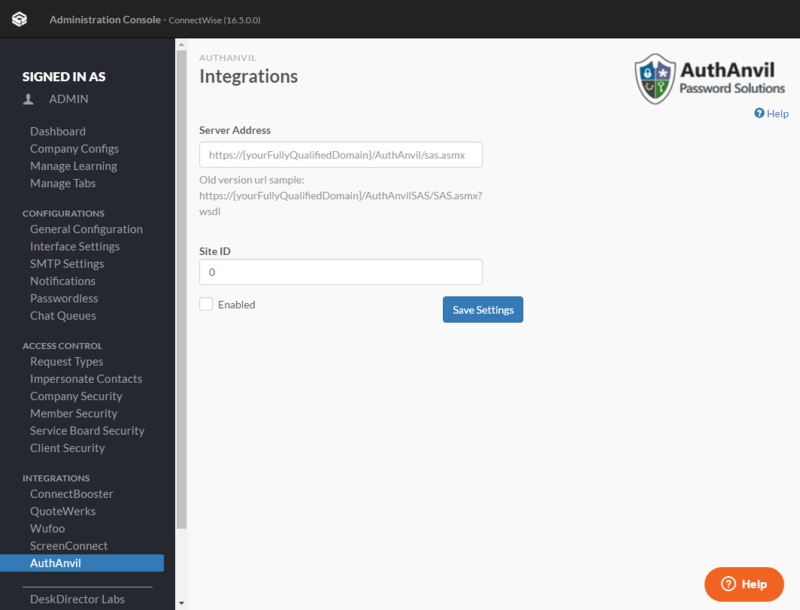 In order to integrate ScreenConnect to DeskDirector, all you need to do is add your ScreenConnect Server URL to the Administration Console. Now when viewing a ticket session in the Staff HUD, you can initiate a remote session by clicking on the device name drop down from the details ribbon. This will take you to a browser where you&apos;ll be prompted for your password. After entering your password you will be able to remote control the target machine. You can also use the remote control function from the administration console. Simply go to Company Configs. Click on the clients tab. Click the ScreenConnect link. You will have to once again enter your password and username to control the target machine. In order to enable two factor authentication with AuthAnvil, all you need is your domain and site ID. If you want to enable two factor authentication within your resource&apos;s record on the Member Security page, click on the resource&apos;s name and check the two factor identification box.